Add elegance and style to your property with an exquisite driveway from T&R Paving Ltd. A beautiful, individual approach to your property is assured, as our long-lasting concrete and gravel driveways are known for their high-quality. Serving clients throughout Chessington, Kingston, and the surrounding area, we are more than happy to assist. We raise the standards with our high-quality driveways! There’s a vast selection of designs to choose from, and we only use the finest materials. These include concrete, gravel, and tarmac driveways. Priding ourselves on our attention to detail, from design through to completion, we ensure you receive a bespoke solution. Enormous care goes into the design, preparation, and construction of the foundations for your driveway. This ensures the correct handling of surface and storm water, in line with planning regulations. By ensuring that the base and sub-base are strong enough, level enough, and properly compacted to the highest standards, you receive a driveway that is stable, strong, and resistant to subsidence. Our advisors, designers, and installers ensure that your driveway exceeds every requirement and expectation.  Vast selection of colours to choose from.  From small back gardens to major installations.  Driveway maintenance and repair service.  Driveway cleaning and driveway sealing.  FREE Estimates – no obligation.  NO payment until completion.  ALL our work is fully guaranteed. Resin-bound driveways have become a popular choice due to their durability, professional appearance, and low maintenance finish. Our resin-bound solutions transform your property, boosting both the appearance and value of your home. 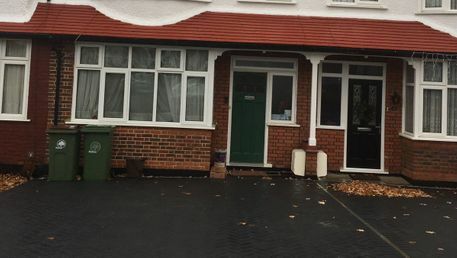 In most cases, resin-bound paving can be installed directly over an existing drive, making the process hassle-free and simple, while also keeping costs to a minimum. Our dedicated and trained team have a wealth of experience in delivering high-quality resin-bound surfaces. We work closely with our customers to ensure their expectations and requirements are fully met at the end of each project. We help you design and plan a new driveway that perfectly matches your home and style. Designed to last, resin driveways provide a low maintenance and durable solution. Your new driveway perfectly suits your home, as we have a full range of colour and style options. At T&R Paving Ltd, we provide beautiful concrete driveways which are guaranteed to complement any property entrance. Our concrete driveways are available in a wide range of colours and textures, which allows you to choose the style that best suits your home. We’re happy to provide you with samples and advice to help you make your selection. 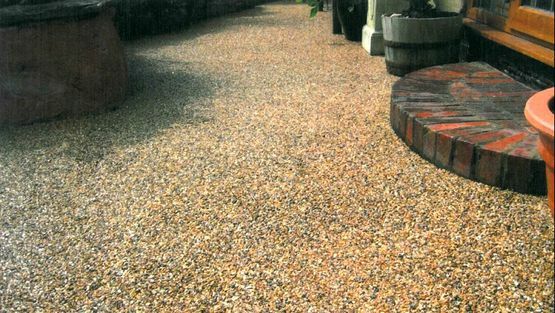 Made in the UK from natural aggregate, Bound Gravel transforms your domestic driveway, old or new! As well as laying gravel on a new base, our team can lay Bound Gravel over existing asphalt and concrete driveways, which means a faster, quicker installation with less mess. Our permeable resin-bound driveways combine stunning looks with a fully permeable, hardwearing, SUDS-compliant surface that doesn’t need planning permission*. An eye-pleasing alternative to loose gravel, concrete, and brick, a Bound Gravel domestic resin driveway needs little maintenance. Once installed, it rewards you with many years of outstanding performance. PLEASE NOTE - *No Planning Required - Government legislation (2008), states that you do not need planning permission if the surface to be covered is less than five square metres, or if the new surface is permeable. Bound Gravel resin-bound driveways deliver a beautifully smooth, accessible finish, with no loose stone to migrate into other areas. This makes it foot friendly, and ideal for adjoining lawn areas. 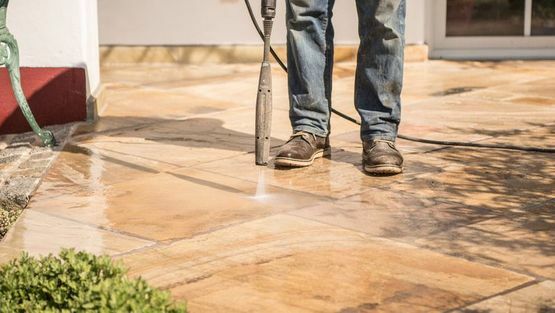 A Bound Gravel domestic driveway only needs periodic sweeping and occasional power washing to keep it looking as good as new. The properties of Bound Gravel result in minimised weed growth and a reduction of puddles. 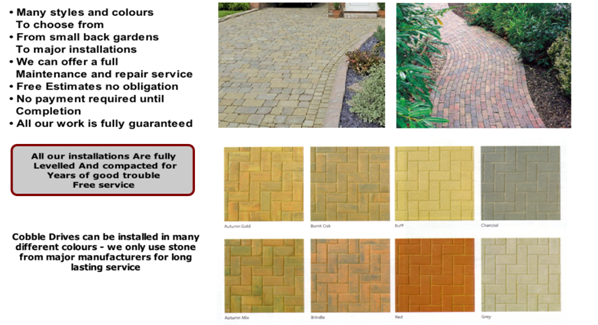 COBBLE DRIVEWAYS DESIGNED & INSTALLED IN CHESSINGTON, KINGSTON, CROYDON, WANDSWORTH, & SURROUNDING LOCAL AREAS. 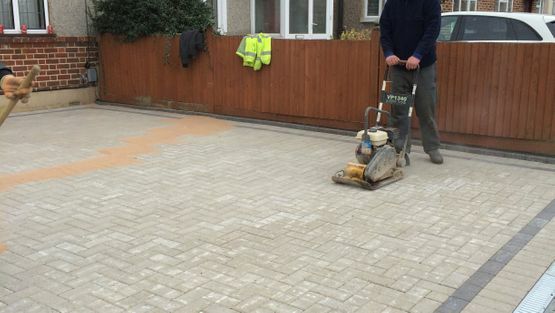 Contact our trusted team, in Chessington, Surrey, for further details about our gravel and concrete driveways.